In its last tournament of 2018, the Harvard women’s tennis team hosts Harvard Invitational this weekend. The team will see competition from Boston University, Syracuse, Georgetown, Cornell, and Michigan State. The team has had a successful preseason so far and is coming off a 15-3 win in the Harvard Fall Scramble a couple weekends ago. On Friday, the Crimson will split up the team to compete against Georgetown and Michigan State. Syracuse serves as Saturday’s lone opponent, and a matchup with Boston University will cap off the weekend on Sunday. All matches will consist of singles and doubles play. 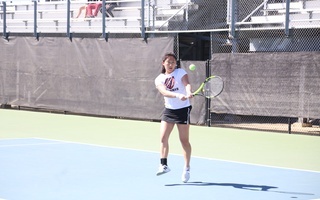 For freshman Rachel Lim, the focus on the doubles play over the past week has been key to preparation. 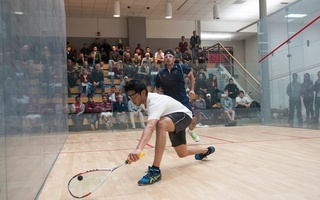 Harvard is an impressive 21-9 in doubles matches over this offseason, yet the team sees room to improve. Practices have have been emphasizing aggressiveness and communication. The freshmen on the team, Annika Bassey, Rachel Eason, Chelsea Williams, and Rachel Lim have proved to be a strong force for the team. They won seven out of their eight matches in the Harvard Fall Scramble, and Eason and Lim both went undefeated in singles play. The combined freshmen singles record over this preseason is a remarkable 18-5. The freshmen are clearly making a positive impact on the team’s success, and perhaps that is because of the team’s focus on building a positive, cohesive team for all classes. The team has been emphasizing teamwork and bonding, particularly with the freshmen. This past weekend, the team invited two military servicemembers to speak about holding each other accountable, and they took this practice into action through a 7:00 AM hike in 40 degree rainy and windy weather. Heading into the final match of the season, the team has been clearly been focused on building camaraderie and accountability. For mental toughness, the team speaks to a sports psychologist to obtain that mental edge that is absolutely key for success in tennis. The team recognizes that mental preparedness and mental toughness is just as important as consistent fitness and strong physical shape. While emphasizing the team dynamic, the team has also been encouraged to search for how they individually contribute to the success of the team. The team is only as strong as the individuals who make it up. This tournament is not only an exciting opportunity to see great tennis matches, but it is also special for the teams, because it includes a social event for all schools. The Saturday night banquet serves as a social event for all the schools in which all players get to know each other over dinner and dancing. However, the Crimson sees this weekend as an opportunity for important, competitive matches, more so than bonding with the other teams. It will be a strong judgement of their potential success in the spring season. 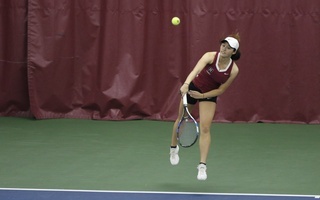 The University tennis team will play Leland Stanford at Longwood Wednesday.